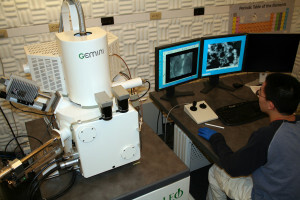 Scanning electron microscope (SEM) imaging at very high resolution (1 nm at 20 keV and 2.5 nm at 5 keV) is possible with certain types of specimens. Its superb performance, particularly at low accelerating voltages (i.e., 0.5 to 3 kV), makes it especially suitable for imaging the surface detail of polymeric, biological, and other low-density materials. An in-lens secondary electron detector enables a very short working distance and responds to the lowest voltage secondary electrons. Transmission Electron Imaging TEM grids may be used in a special stage in conjunction with a detector below the specimen to obtain transmitted electron images.